Ah, Fair Isle...a beautiful Scottish export! Fair Isle is actually an island in Northern Scotland about halfway between the mainland Shetland and Orkney Islands (it's actually part of the Shetland Islands). Today the island is owned by the National Trust for Scotland and there are only about 70 islanders still living there today. Fair Isle is also one of the most intensely studied areas in Scotland by archaeologists since they've found evidence that the isle may have been settled by Neolithic people up to 5,000 years ago. The island sounds absolutely beautiful--I definitely want to see if David and I can make a visit there sometime soon! So, what about the knitting? Knitting has always been a staple trade of the island (and that of the region). Fair Isle knitting is distinguished by the use of two different colours of yarn in each row of knitting and a full size hand knit sweater (jumper) will often requires in excess of over 100 hours to complete (although the stitches are pretty basic--just the knit stich). It is also traditional knitted on circular needles and often includes usually around five colours with only two per row. Nowadays the term 'Fair Isle' is much more widely used to just refer to sweaters with colourwork knitting (in alternate colours). It was made popular when the Prince of Wales (Edward VIII) wore knitted Fair Isle tank tops in public in 1921. And of course, it was very popular in the 1940's. Ooohh...how I love the 1940's Fair Isle sweaters! I've been sitting on the knitting fence for awhile. I don't actually know how to knit but I am oddly amassing a set of lovely vintage knitting booklets. I would love to learn to knit--there was even a knit camp in Scotland last summer! I might take a class. My main concern is with the amount of time it takes coupled with my desire for complicated looking designs! This one seems to use the term 'Fair Isle' a bit loosely? It's not what I would picture as a traditional Fair Isle sweater. I do love the pink with red and green design! So lovely!! This is such a classic example of the type of jumper I think of when I hear the term 'Fair Isle'. I love the combined jumper and cardigan and how the Fair Isle knitting slopes off the cardigan! Again, this isn't what I would see as a classic Fair Isle sweater but it is very cute! This one may well be my favourite! I love the shoulder lines on this jumper and cardigan! I love how the Fair isle knit is done on the entire jumper but only on the upper half of the cardigan. And OMG, isn't her hair amazing? What about you? Do you love Fair Isle sweaters? Do you knit? Have you ever done a Fair Isle knitted item? Is it hard? Colourwork isn't something I'd do as a beginner knitter. Although having said that, I tea cosy designed to look like a strawberry was one of the first things I knitted and involved two colours, so it's not impossible. Perhaps start with something small that wasn't a cardigan or jumper. Perhaps fingerless gloves or a cowl (the latter would be easier as you wouldn't need to get involved with double pointed needles). A couple of ideas below. Or, you could find a design you like, knit a rectangle and then seam it and leave a small hole to make fingerless gloves (without having the trouble of a proper thumb hole). 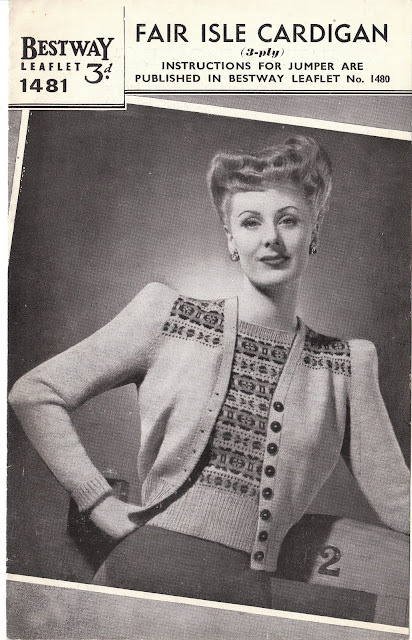 Those 40s jumpers are beautiful - I guess your favourite one probably has some sort of concave shoulder pads?! I can knit but I find it terribly time consuming - I'm too impatient! For that reason I rarely knit these days. I would recommend mittens for a beginner - they are usually fairly simple shapes and can be knitted on a circular needle in 2 colours - perhaps a good chance to practice the techniques you'll need for your Fair Isle jumper! I love to knit and have dablbled in fair isle; it's definitely not as challenging as I expected. That said, knitting is one of those things where everybody has to start at the begining. I think you should go for it! Remember to be patient and keep in mind that once you conquer the fundamentals, you are equipped to tackle any project you can imagine! I highly reccomend signing up for Ravelry.com, also Check out YouTube for loads of instructional videos. And, make friends with the staff at your local yarn store, they're full of knowledge and usually pretty will to lend a hand. Good luck! I knit. I love knitting colourwork pieces. Fair Isle is not hard- except getting your tension right where the two colours are changing. Colourwork is one of my favourite knitting styles- they always look so complicated. But you have to also look into Shetland laces (stunning), Arans (because cables are lovely too) and selbuvotter if you are going for local and traditional :) The Nordic countries and the Northern parts of Scotland shared a lot when it came to knitting. As I consider myself still as a novice knitter, I never tried Fair Isle. Though tempting, it is still daunting. 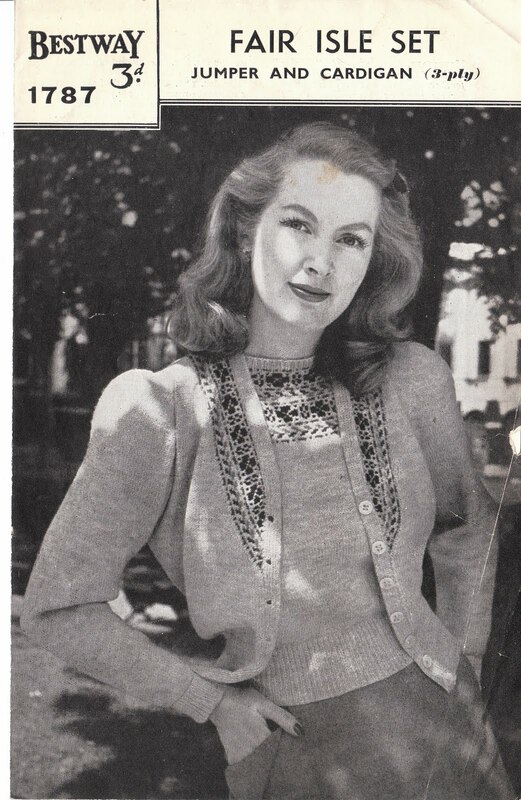 There are several free knitting patterns available on the net, even vintage. I'm on my second vintage knitting project and it's going very slow! 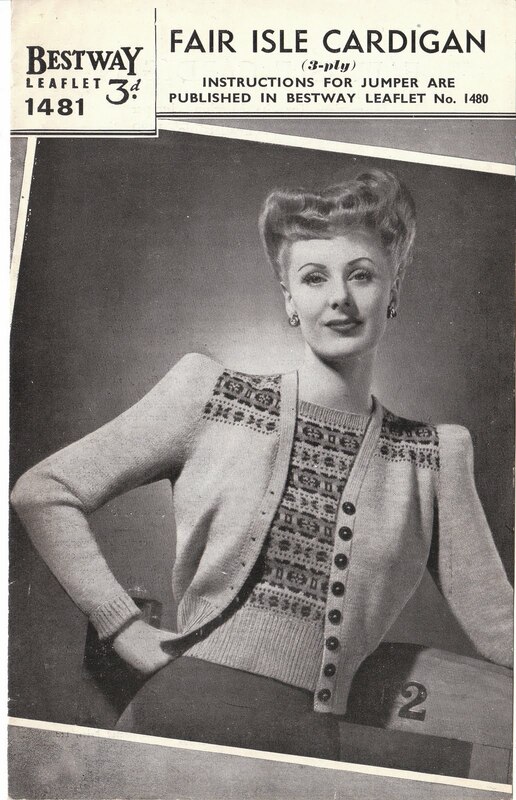 The trouble is... most vintage patterns, however beautiful they are, involve very thin yarn and needles. So it takes far more time than your average modern pattern with big needles. Other than that, go for it, perhaps pick a Fair Isle slipover? Save yourself some work on sleeves. I have both the 70s edition of A Stitch in Time and the re-release, so I have two versions of 1787! It's on my to-knit list, but I haven't gotten around to it yet. I love Fair Isle, but I don't like all the knitting hours! I knit my husband a fisherman's aran in a rather bulky yarn and it took 80+ hours! I can crochet, but haven't been able to get the hang of knitting. My granma was an expert knitter; she went so fast that her needles were hot! Oh what lovely sweaters! I'm a novice knitter, having just learned a couple months ago. Knitting isn't too difficult, but I wouldn't dare doing something like a fair isle sweater yet! Love to knit -- taught self from Coats & Clarks "Teach Yourself to Knit/Crochet/Embroider/Tat" booklet, which is still in print. Agree that color work is tricksy for a beginner, because of tension issues. But it is not difficult, and charted designs are readily available. They work for needlepoint, knitting and crocheting. Buy yourself some good woolen yarn and a pair of size 5 (US) needles, an instruction booklet -- or sign up for a class, or research the internet for tutorials -- and have at it. It's like mastering any new skill, awkward at first, but ultimately rewarding. Think of the connection to people of all gentders, throughout the ages and all over the world, who have practiced this fiber art! I have knit a few small fair isle items--I'm actually working on a baby hat with wee ducks at the moment--but haven't tackled a sweater yet. As others have said, fair isle as a technique is not too difficult. but you do have to have a sense of what your tension should be like so you don't make the fabric pucker by pulling the floating yarn too tight. Fair Isle cardi and I'm not really enjoying it. While it's not hard, it takes a lot of concentration. I love the look of Fair Isle but I prefer to knit cables and lace. So lovely! I've been working on a Fair Isle sweater off and on for over a year. It's this one: http://www.ravelry.com/patterns/library/autumn-rose-pullover and it's not nearly as difficult as it looks, but I do get distracted by so many other projects! Plus it's hard to think about such things in the heat of summer. What a great question & following thoughts that I've been having for months. I've read the previous comments avidly - some really helpful suggestions. 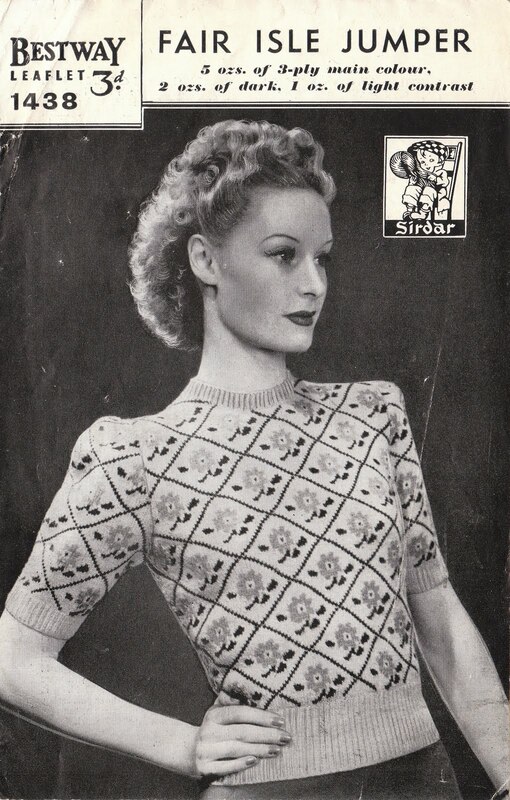 I too love the vintage patterns, adore the idea of fairisle but was scared it was too unforgiving. 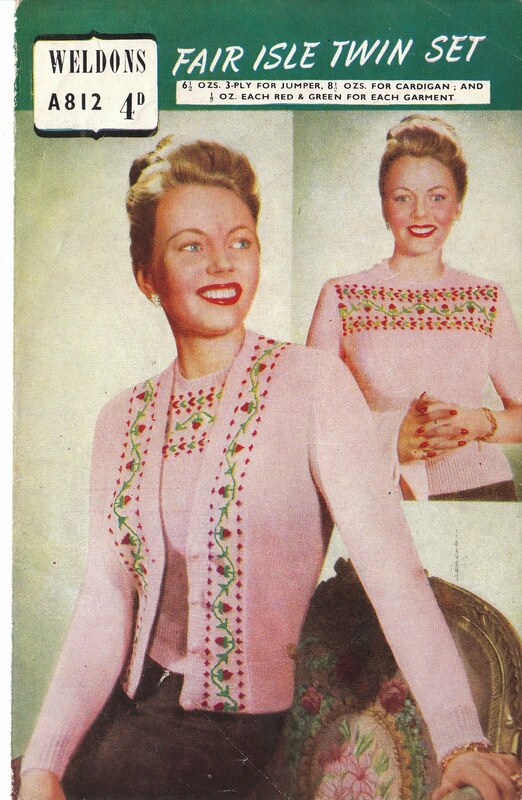 I have ended up purchasing some vintage patterns which I think might be bed jackets (but so pretty! should I be ashamed ? I won't wear them in bed!) But haven't got wool for them yet. Or needles. But have been crocheting flowers. One thing I've found whilst learning to knit a lacy scarf is that knitting is more sociable as you can do it in front of the TV with family (as long as there are no subtitles!) It doesn't mix with wine though - too many inexplicable mistakes!! Ooo what are you going to make? Fair isle just needs lots of patience. It's only stocking stitch really, so not too daunting. Once you've mastered that, then you should have no problem. I was lucky enough to pick up two fair isle pattern books at a charity shop for £1 each last week, lovely to look at. I also read somewhere that this patterning was popular during the war years because it allowed for the use of lots of odds and ends of yarn - nothing was wasted. OMG, those patterns you have are adorable! No wonder you want to learn Fair Isle knitting! I just finished my first colorwork knit last week, and it wasn´t at all as difficult as I expected. I made a hat, a great starting project as you can make it on the round, and with circular needles. Your favorite pattern is my favorite too. Absolutely adorable! I just started knitting, I find if very relaxing and easier to take with me than sewing but I am not at 40s sweater point yet but I can't wait to get there make some of those lovely 40's styles!!! Wow, such lovely patterns! I love fair isle! I've got one fair isle jumper I've knitted and the planning of another in the back of my mind. Thanks for this post! 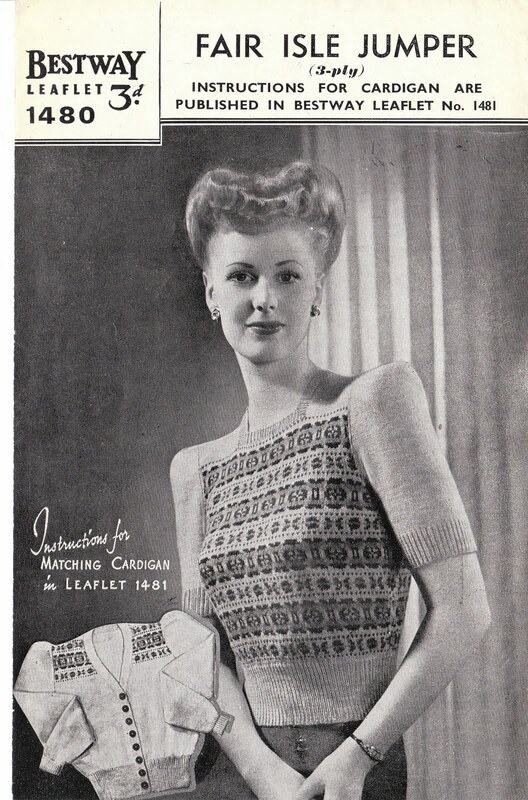 Like you, I love vintage knitting patterns (although I don't own many) and I can often imagine the result of many hours of knitting fitting nicely into my wardrobe. However, I didn't learn how knit until two or three years ago. I learned the basics using books and tutorials on knitting websites and I have made a sweater and a cardigan in simple, basic stitches. I wear the cardigan a lot and I'm proud of having made it. But it took a LOT of time. Too much time for my taste. I'm all for slow fashion but in world, knitting doesn't compare well to sewing on many counts. I can make my own sewing patterns, so I know what I'll get and how it will fit, with knitting, I'm at the mercy of the pattern and the stitches-per-inch guides (which are still a bit of a mystery to me anyway). I can find decent fabrics cheaply, or at least affordably. For yarn, there is no such thing as an acceptable bargain option to be found here. Also, and I know this is really only about experience, if anything doesn't work out in sewing, I can fix it. In knitting, not a chance. That being said, I don't think learning and developing a new skill is ever a bad thing. I may knit more later, just not right now. How wonderful! I'm an on-again, off-again, knitter. . . so whenever the fancy strikes me, I knit. Knowing how good you are at sewing, it wouldn't surprise me if you could quickly pick up knitting. It's not a bad idea to start with something simple - but if you want to be adventurous and go for something harder after you know the basics - why not? I did. One place I've found with a lot of knitting patterns and resources is www.knittingpatterncentral.com. You might also search youtube for how to knit videos - as I'm sure they have some helpful ones! OMG- the shoulders. Fair-Isle reminds me of my ild English aunt- which is a good thing! Being a knitter, I of course think you should learn to knit! I love fair isle, but have never yet attempted it. You should read the book Sweater Quest...the author documents making a fair isle sweater in one year and it is fascinating and funny. So it makes perfect sense that people snapped up these darning skeins and cards of wool to knit Fair Isle patterns. I happen to have some of these old darning items in my collection of vintage haberdashery. Let me know if you'd like to see them. I've never done a Fair Isle pattern yet, but I do knit! I'd love to do some of these. Any chance you could scan them in and sell a copy?